These past few days have seen record-setting cold here in the Chicago area, with forecast lows in the -20s, and a high yesterday of -11˚F (and windchills in the -50s). So, like many businesses, we decided to close down and discouraged our staff and customers from venturing out in the weather. With a cold-weather day on our hands, we decided to do some experiments. After all, this is the first time we’ve ever had such frosty conditions available to us! We’ve all been taught that the freezing point of water is 32˚F. Now, that doesn’t mean water definitely will freeze at 32 degrees – it takes some energy for liquid water to convert into a solid, and by manipulating other factors, water won’t necessarily freeze, even if the temperature is lower that 32˚. See this cool article from the Smithsonian about that topic. Similarly, according to our chemistry manuals and other book sources, 80 proof vodka (40% alcohol by volume) has a freezing point of -10˚F (a bottle of our aquavit, at 45% abv, would have a freezing point of about -18˚F). 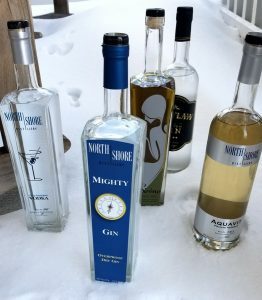 Since it was going to be at least that cold around here, we figured we ought to put some bottles of spirits outside and find out what would happen. We filled an ice tray with 80 proof vodka on one side, 70 proof flavored vodka on the other, and covered with plastic wrap. 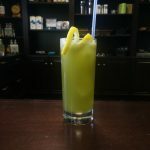 Sirène Absinthe Verte – 120 proof (60%); this one is infused with herbs after distillation and has a crazy amount of botanicals in it, so we usually tell people to never freeze/refrigerate it. Ice Cubes: very cold, but the 80 proof vodka was not frozen at all. 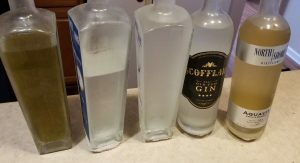 The 70 proof flavored vodka began freezing a little within a couple of hours, and was icy on the top but still very liquid in the morning. Bottles: none were frozen at all – no ice, no nothing. The Scofflaw Old Tom was hazy though. The temperature did not rise above -11 (-9 on our front porch, according to our trusty weather station given to us by my father). Around noon, we took all the bottles out of the box and separated them. They weren’t getting cold enough, obviously. 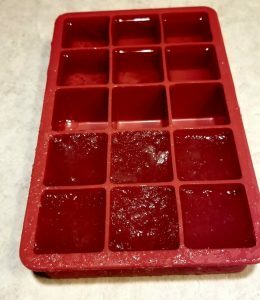 Ice Cubes: the 70 proof ones were slushy, the 80 proof ones were very cold but not slushy at all. Bottles: none were frozen/freezing. The Scofflaw Old Tom was very hazy, and the Aquavit became hazy by the evening. As the night went on, the Absinthe became hazy as well. 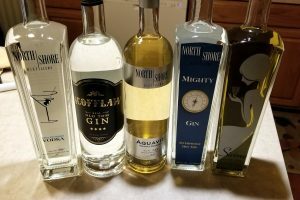 The North Shore Vodka remained very clear in the bottle, and the Mighty Gin was slightly hazy. The fill levels were down noticeably on the Aquavit and Old Tom – they were full to the neck when we started (see picture above). 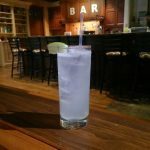 We added some of the Mighty Gin to a glass of ice and tonic water. 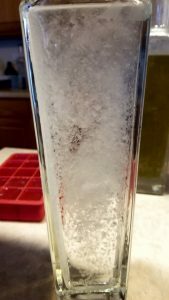 The gin poured with distinct trails, and ice crystals seemed to form and fall to the bottom of the glass right away (see photo at right). The drinks were very hazy and the glasses were very cold. We poured some gin into a shot glass, and took a sip. It was very cold, but not as cold/painful/harmful as we feared. It was just super-cold gin. But the bottle was extremely cold/painful to hold. 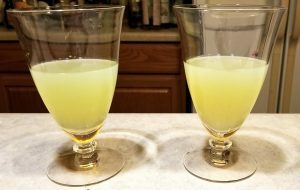 We brought in the Absinthe and poured some into two glasses. It poured like a syrup, kind of like the way our other spirits do when we serve them from the freezer at home. We added room temperature water to one, and chilled water to the other. We did not notice an appreciable difference between the two, but both glasses were very cold. On Wednesday night, the air temperature dropped to -25 or so, and we left everything out on the porch all night. When we got up in the morning, it was still -24 (around -18 on our porch). So what did we find? Ice Cubes: the 70 proof ones were very slushy with some solid ice areas, the 80 proof ones were very cold but still not slushy at all. In the 70 proof ones, the ice tasted like ice – it was not boozy, but what wasn’t frozen was very boozy. Bottles right after we brought them in. Bottles: none were frozen/freezing, but all were a little to a lot hazy. It seemed that the lowest proof bottle (the vodka) was the clearest – how about that! We took all the bottles inside and poured some of each into a glass. The Vodka! The vodka had some ice crystals in the bottom of the glass when we poured it – just a few. And, then, all of a sudden after a quick shake/jostle, a ton of ice crystals formed inside – right before our eyes! I didn’t get a picture of the formation, but here’s one taken right after (you can see it before in the picture above). 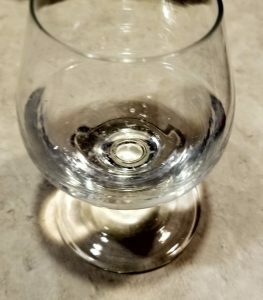 And when we poured another sample, it was full of ice crystals now, and tasted different than the sample we’d poured just a few seconds before – the before sample seemed boozier, the after sample was smoother and rounder, even with the ice chips. Vodka poured from the bottle as soon as it was brought inside. Vodka poured after it was shaken. 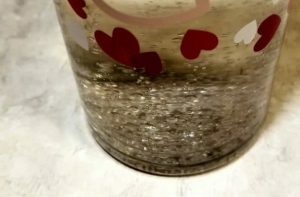 Also, when we shook up any of the bottles that did not have ice in them, the bubbles that formed moved very slowly – much slower than they would move if the bottle was at room temperature. So. What Did We Learn? 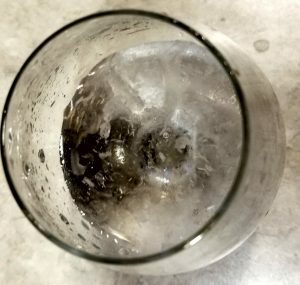 What happened in our ice cubes was something that we might have expected (and was predicted by some chemist/spirits nerd friends) – the water molecules grouped together and froze, leaving behind a central core of even higher strength spirit (that was not going to freeze – it wasn’t cold enough). This is how the high-octane beers out there are often made, and also how apple jack was originally made – you “jacked” the apple cider to raise the proof by freezing it and removing the parts that actually froze. If we had filtered out the ice chips right away, what was left would have been an even higher-proof version of the spirit. You might get some ice in it, but it’s probably not going to freeze all the way. The pressure in the bottle seemed to help it stay as a liquid, and the ethanol molecules will join together to form an alcoholic core that resists freezing. If this kind of weather happens again, we’re also going to try with a half-full bottle to see if that changes anything – the pressure definitely seemed to be a factor, and maybe the volume, too – as demonstrated by what happened with the ice crystals after we equalized the pressure in the bottle. We have always been worried about people putting our absinthe into the fridge or freezer, since it has so many herbs infused and distilled into it. We tell people to store it in a dark cabinet, at room temperature, and never to put it in the freezer or refrigerator. Well, we now know it’s not as delicate as we thought. It’s probably a good idea to stick with our original guidelines, but it’s not going to ruin it if it gets cold for awhile – our bottle spent 48 hours at -10 or lower and it still looks & tastes fine. All in all, a fun way to spend our time during the arctic conditions. 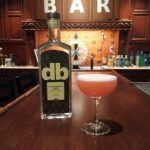 We learned a few things, had some fun, and had some delicious drinks, too!